Mobile phone and laptop sales have increased consistently by double digits in the last years. Now with the presence of smartphones and tablet PCs this trend will boost in the following years. This new age of communications, information and portability would not have been possible without energy storage solutions to power these portable devices. Lithium batteries are currently the dominant technology in the energy storage space because of their superior energy density characteristics. The consumer electronics industry has pushed their production to the scale of billions and consequently, through economies of scale, optimized its supply chain and reduced their price. However, lithium battery technology capabilities are being challenged by the modern multifunctional portable devices which are increasingly requiring higher performance in terms of power density. Whilst current research and development pathways aim for the emergence of a new generation of high energy density technologies, alternative energy storage technologies, are challenging the dominance of lithium batteries. 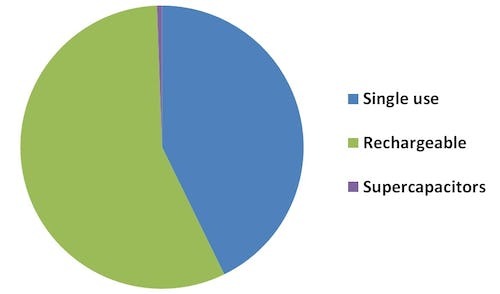 This is the case with supercapacitors, which are an emerging energy storage technology, whose characteristics make them strong candidates for satisfying those specific functions where lithium batteries underperform. On the other hand, the developments of electronics and material science is allowing for new developments in the energy storage field. Now we can build, or better said, print, thin film batteries on different surfaces allowing for new energy storage solutions which coupled with energy harvesting (collecting energy from the environment) and radio frequency technologies unlock many potential applications as traceability in consumer product supply chains and internet remote localization without the need of big devices, just to mention some examples. This report leads you from the basic concepts to understand the technologies in the energy storage industry including the advantages and limitations of different technologies. 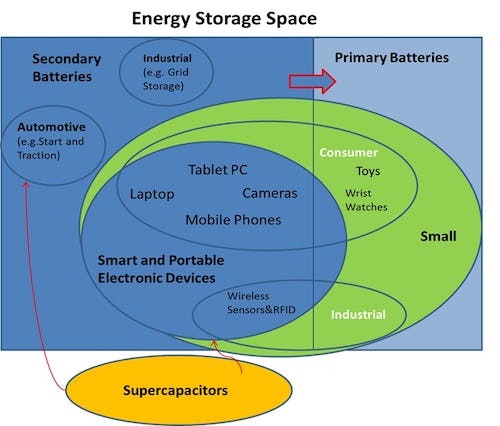 This is followed by a comprehensive section of the supercapacitor technology explaining where they fit in the energy storage industry and their potential applications. Finally it introduces the emerging and future technologies in the energy storage space: Thin Film and Flexible Batteries. We present both for batteries and supercapacitors their current research and development paths leading to improvements. Through these sections we highlight the work of the companies involved in this industry. Expanding from previous editions we present potential cost reduction paths for lithium batteries, drivers of the consumer electronic industry, the potential role of super capacitors and innovative technologies and their niche markets. In addition this report presents IDTechEx's comprehensive study of companies in the lithium battery industry: 138 manufacturers of lithium-based rechargeable batteries, including their country, cathode and anode chemistry, electrolyte morphology case type and application priorities. We present a 10 year forecast on lithium batteries, supercapacitors, RFID and wireless sensors applications. Energy Storage for Smart and Portable Electronic Devices is currently the biggest and fastest growing battery market. The Consumer Electronics segment is one of the fastest changing markets. Portable electronic devices are becoming increasingly multifunctional and this trend is currently requiring better performance from batteries. This report explains the drivers in this changing segment, what are these changes demanding from battery technologies and what are the research and development paths to improve battery technologies accordingly. We present a new entrant technology in the energy storage industry: supercapacitors, which compared with batteries, can deliver high power instantly and do not rely on chemical processes to store energy so they have longer useful lives. We present what is the role of this new technology as an alternative to improve battery performance and satisfy the changing demands of the consumer electronics market. Indeed supercapacitors as an emerging energy storage alternative are challenging the predominance of batteries and complementing their functions. By the other hand thin film batteries open a new category in energy solutions for specific niche markets which can potentially launch them to mass production. RFID and Wireless Sensors are two examples. Emerging battery manufacturing technologies as spray battery painting and new technologies as transparent batteries hold the promise of opening new possibilities in portable device design and energy storage applications. This report has a global coverage and presents global forecasts and players in the sector. In addition this report presents IDTechEx's comprehensive study of companies in the lithium battery industry: 138 manufacturers of lithium-based rechargeable batteries, including their country, cathode and anode chemistry, electrolyte morphology case type and application priorities. Following the trend of smartphones, portable devices are becoming increasingly multifunctional, in this report you will find what this trend will be demanding from the energy storage industry. What trends are behind the primary consumer battery market contraction? How supercapacitors will step in the consumer electronics industry? What will be the value of this market in 2023? What are the pathways for cost reduction and increased performance for Lithium Batteries?